Securecloud-dl.com is the PUP that uses misleading techniques to prevent removal. Use Reimage to locate malicious components and get rid of them faster than with uninstall instructions. A full system scan blocks virus reappearance and prevents traffic to malicious domains. Securecloud-dl.com is a suspicious website that is used by adware program to redirect users to promotional sites. These annoying activities can begin on any web browser after silent infiltration of a potentially unwanted program (PUP). However, it can be stopped by scanning the system with anti-malware software and resetting the browser. Google Chrome, Mozilla Firefox, Internet Explorer, Microsoft Edge, etc. offering to download software updates. The purpose of Securecloud-dl.com adware is to boost traffic to various websites in order to increase their sales, promote services or trick into installing potentially dangerous programs. Developers of ad-supported app generate revenue from this activity. Thus, they do not care about user’s experience and potential dangers that might be lurking on these sites. The same adware might also display misleading pop-ups, banners, in-text and other ads. 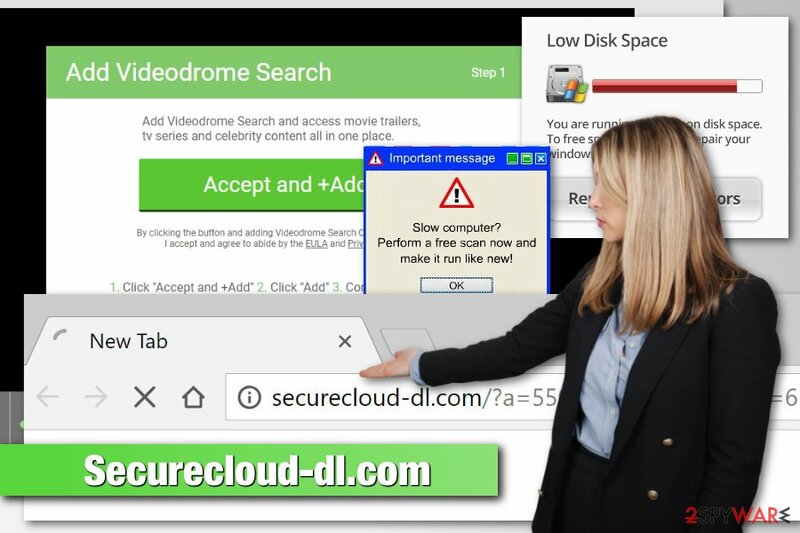 Clicking them is also not recommended due to the same Securecloud-dl.com redirect problems – possibility to end up on a highly suspicious website. 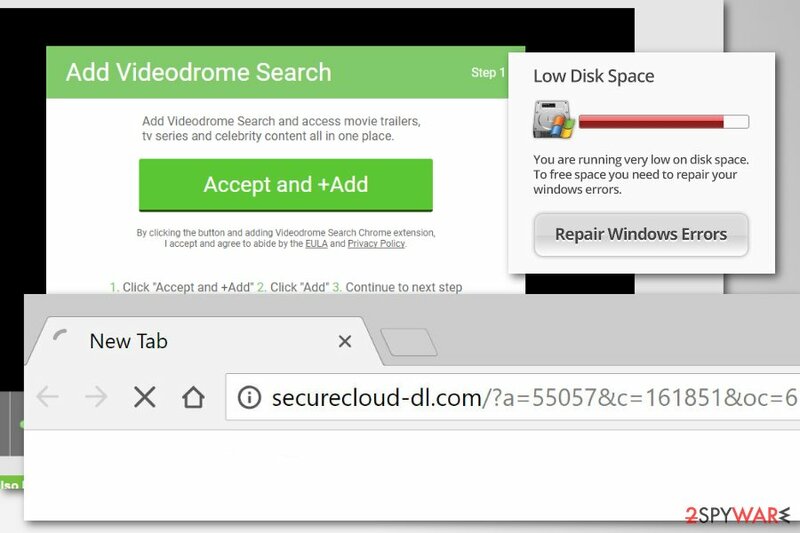 Securecloud-dl.com ads might seem interesting, but it’s just an illusion. Adware might collect various information about users and based on aggregated details create targeted ads. The PUP might track information about your search queries, visited websites, clicked links or ads, and similar details. All this information allows knowing user’s preferences and delivering ads that he or she would be willing to click. Indeed, each click is worth specific amount of money. Hence, you can expect your crashing and freezing browser due to the ads attack. To stop browser redirects and ads, you have to remove Securecloud-dl.com adware from the computer and reset affected web browsers. You can follow the guide at the end of the article and do this job yourself. However, it might be difficult to locate these entries. We suggest simplifying Securecloud-dl.com removal by scanning the system with Reimage or another anti-malware/anti-spyware software. Updated security program can clean adware-related components within several minutes. Securecloud-dl.com is a suspicious website that is used for browser redirects to questionable sites. Adware can get into the system unnoticed when users download freeware or shareware incorrectly. The PUP can be included in any freeware package as an optional component. If users do not opt it out during the installation of the primary program, they have to deal with unpleasant consequences. To avoid infiltration of adware, you have to use “Custom” or “Quick” installation and carefully follow the process. One of the steps might include a checkbox with pre-selected “optional downloads.” Your task is to remove the ticks and stop their installation. Specialists from Avirus.hu remind that “Recommended” or “Standard” settings does not reveal what third-party apps are included in the same software package. Therefore, when you use this setup, you give permission to install the whole bundle of unknown applications. Securecloud-dl.com removal can be completed manually or automatically. Our team has prepared illustrated manual elimination instructions, so if you are thinking of this method, please follow them carefully. However, we believe that it’s better to remove Securecloud-dl.com automatically and dedicate this nasty job for anti-malware software. Once security software deletes PUP and its related files, you will need to reset the browser as explained below. Here, look for Securecloud-dl.com or any other recently installed suspicious programs. Wait until you see Applications folder and look for Securecloud-dl.com or any other suspicious programs on it. Now right click on every of such entries and select Move to Trash. When in the new window, check Delete personal settings and select Reset again to complete Securecloud-dl.com removal. Once these steps are finished, Securecloud-dl.com should be removed from your Microsoft Edge browser. Here, select Securecloud-dl.com and other questionable plugins. Click Remove to delete these entries. Now you will see Reset Firefox to its default state message with Reset Firefox button. Click this button for several times and complete Securecloud-dl.com removal. Uninstall questionable Chrome extensions that might be triggering browser redirect to Securecloud-dl.com. Here, select Securecloud-dl.com and other malicious plugins and select trash icon to delete these entries. Click Reset to confirm this action and complete Securecloud-dl.com removal. Here, select Extensions and look for Securecloud-dl.com or other suspicious entries. Click on the Uninstall button to get rid each of them. Now you will see a detailed dialog window filled with reset options. All of those options are usually checked, but you can specify which of them you want to reset. Click the Reset button to complete Securecloud-dl.com removal process. ^ Isaac Ashe, Ruth Ovens, James Rodger. Millions of Pornhub users infected by malware - what to do if you're affected. Birmingham Mail. News website. ^ New tech support scam launches communication or phone call app. Microsoft Secure. The official Microsoft blog. ^ Avirus. Avirus. Hungarian cyber security news. This entry was posted on 2018-03-27 at 03:20 and is filed under Adware, Viruses. You can quickly scan the QR code with your mobile device and have Securecloud-dl.com manual removal instructions right in your pocket. 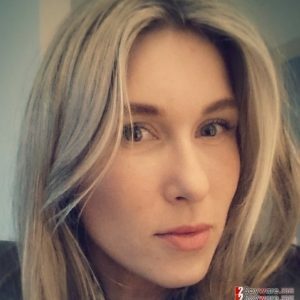 How did you remove Securecloud-dl.com?